What did 2018 look like in 1968? In 1968, a group of experts contributed chapters to a book called "Toward the Year 2018", a visionary take on the next 50 years of science, technology, politics, economy, culture. Earlier this year, Paul Collins’s article in The New Yorker reminded the world of the book’s existence and gave an overview of the rights and wrongs in its 13 chapters. So how does the reality of communications today compare to the prediction John R. Pierce made in his chapter "Communication: Face-to-Face Mass Communication Will Become Worldwide"? The subtitle itself sounds promising and very 2018, but how about the rest of it? Pierce was one of the engineers who shaped the profile of Bell Labs as the world’s leader in innovation. When he wrote this chapter, Pierce was the executive director of the Research Communications Sciences Division and he'd a view of the future Bell Labs was creating. He had a talent for simple explanations of complicated technical concepts for wide audiences and for brave science fiction writing (he wrote sci-fi under the pen name J J Coupling). It opens by praising the scientific and technical developments driven by the rise of the semiconductor industry, as transistors (devices Pierce himself named in 1948) helped miniaturise modern electronic circuits and put them in phones, TV sets, radios and communication satellites orbiting the planet. "Communication technology evolves continually, but today we have entered an era in which change is particularly rapid", writes Pierce in 1968. We write the same today as that is how exponential growth works with every decade bringing unprecedented rates of change. "We expect that, when complicated solid-state circuits are incorporated into a telephone set, they will be so inexpensive to replace that they will be thrown away rather than repaired when they finally fail." Our experience today confirms this prediction: we have reached the state where we have to ask for our right to repair electronics as the tyranny of non-repair principles keeps us replacing components and whole devices. Pierce proceeds with a vision for future user equipment, describing what awaits the common phone user in the future. He starts with Touch-Tone, an innovation Bell Labs introduced in 1963, and recognises it as an important driver for change. Touch-Tone (tone dialling) meant that pressing a button on one’s phone produced a unique tone which would be a signal for the automatic switching system. While the beeps of tone dialling might be the only way of making a phone call younger readers remember, a lot of us can remember the clicks of pulse dial as well. Pierce recognised that these tones using the same wire and same communication channel as voice could be used to control remote computers and carry data. He envisages "new terminals [which] will make the transmission and reception of texts almost as convenient and universal as the telephone" and looks forward to editing texts on computers without retyping them. With our word processing tools of the day, we may forget how annoying editing on a typewriter was, and how important this promise of the seamless editing future was for Pierce. It is not enough, though: are the computers going to be able to translate our speech and texts in other languages? Are the computers going to be able to understand us talking, and will they be able to speak? These questions came naturally with the prospects of fast international communication, and Pierce was careful in his predictions. He doubted the computers’ future ability to achieve understanding of humans, both in terms of processing our speech and universal translation services. We have probably exceeded his expectations in this regard with machine translation and voice recognition, even though the funny results we see online or experience ourselves every day originate from Pierce’s main concern that the chips and lines of code don’t really understand us. In the context of speech and translation, Pierce said in a letter to Donald Knuth that "concerning artificial intelligence, I believe I invented the slogan 'Artificial intelligence is real stupidity'." In a passionate letter to the Acoustical Society of America, he described most people in the field of speech recognition as "mad scientists and untrustworthy engineers". After the pessimistic view on computers and language, Pierce returns to optimism with an announcement of Bell Labs’ new project, the Picturephone. Based on the performance of the device and the interest shown by clients, it was expected to take the world by storm in the early 1970s. It would enable face-to-face communication over the phone, conference calls and naturally merge with the existing voice communication. The near future would prove Pierce wrong, and the distant future would prove him right. The Picturephone was a failure. It was expensive and most people with whom you’d want to chat didn’t own it themselves, which meant no video chats for you. When Skype and other video chat applications came to computers in the early noughties and crawled into our phones later in the decade, the vision of Picturephone finally fit into its place. On a screen bigger than Picturephone’s five inch one, Pierce predicted changes as well such as the possibility of recording TV shows for later. He is also interested in the effect of television "broadening of vision" for the viewers, and the effect of world unification by international dissemination of TV shows (special mention here went to Bonanza). The feedback through which the viewers shape television programme was another concern: "eventually their voice is heard, but those who generate the programs may be slow to respond." If your favourite TV show is cancelled, you know exactly how this feels. Pierce then moves to the technical side of things behind the stage, the infrastructure of the telecom operators and where the future will take the physics of transmission. He anticipated the use of higher frequencies for wireless transfer, and the use of optical fibre (which was a very new technology at the time). "At present, a pipe capable of transmitting a light signal would be economically justified only for extremely heavy traffic between two points—traffic beyond what now exists" he writes. "Laser communication is therefore a resource of the future". As I said earlier, the progress of technology is exponential, and so is that of demands: it is no wonder that we found a use for the optical fibre communications as soon as they got to the market. Today, they represent our connected world’s bloodline. Satellite communications were Pierce’s brainchild and it’s no wonder that he is excited about the rapid development of the field. He envisions households equipped with an antenna able to receive satellite TV signals, something we achieved in the decades to come. One concern he has about the future are the inherent limitations of the electromagnetic spectrum: "We must look toward a day in which all usable frequencies will be crowded. When that happens, it would seem best to reserve radio transmission for those uses to which it is particularly and uniquely adapted, such as communication with ships, airplanes, automobiles, and—in general—people on the move." In 2018, we still have the same concern and novel solutions are proposed to tackle it, including smarter ways of using and sharing the spectrum. One thing Pierce is not concerned about is price: he expects the communications to become cheap "whether the communication involves the human voice, text, pictures, or computer data." Only with the fourth generation of mobile services rolling out in this decade have we reached this stage of equal low cost for all types of information transfer on our phones. The internet has become a new world and again, science fiction did not see it coming! In an inevitable section on politics, Pierce notes that the rise of fast, long-range international communications will lead to the "upsetting of old patterns of action, to the injection of politics into the field of communication, and to endless agonising delays in adapting new technology to pressing needs, national and international." It would be great if we could tell Pierce that we fixed it in the meantime, but we haven’t. He didn’t expect it, though. "Perhaps in communication, as in other matters, we can make more rapid progress if we try to solve the pressing and tractable problems first, deferring a completely international solution until a day of higher technology and higher diplomatic achievement." He never said that day would come in 2018. Returning to the question of language and communications, Pierce recognised the ability of fast and omnipresent mass and personal communications to achieve a commonality of language. When the machines cannot provide the translation, they can make people learn foreign languages. Pierce concludes his article with the thought that "[c]ommunication, together with transportation, may eventually homogenize our world. Fortunately, there are forces working against this. Despite the best efforts of well-intentioned men, a certain variety of interest, aspiration, and even achievement will be preserved. It is through such differences that we can judge the potentialities of men on the one hand, and the results of various philosophies and courses of action on the other." What did Pierce fail to see in his vision of 2018? The device you hold in your hand right now: there are no mobile phones in this future world. Then again, most science fiction of the time didn’t include mobile phones either, not with all the flying cars and interstellar spaceships. Star Trek is a notable exception, and it, in fact, inspired mobile phone inventor Martin Cooper. 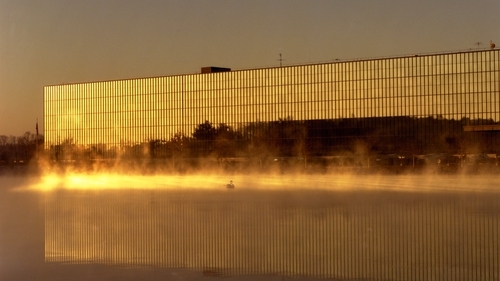 The first call he made from Motorola using the new mobile phone was to the building where Pierce used to work to let Bell Labs know the future is here. The internet is also missing. While Pierce's idea of controlling computers worldwide with a press of a button on your phone was the right way to go, the internet is much more than clients and servers. It has become a new world. And again, science fiction didn’t see it coming! This is by no means a criticism of the futurists or scifi authors, but a monument to the paradigm shift of the smartphones and the Internet. Then again, none of the social scientists in the book has predicted the fall of the Soviet Union. MORE: What technology will we be taking for granted in 2028? Pierce was an experienced futurist and he tried hard to avoid the pitfall of Amara’s law (or Lovelace’s law, to be precise) of underestimating the long-term effects while overestimating the short-term ones. He was intrigued with the social consequences which the evolution (and revolutions) in technology would inevitably bring, even if he did not write about it in depth. Yes, TV over satellite: but what will it do to the family seated in front of it? Yes, Picturephone: but how will it change collaboration? So, dear reader… how’s the self-driving car going to change your eating habits, and how are the drones going to affect our emotional relationships?